Oil fever! It’s hard to imagine today, but starting in 1892 until its peak in 1901, there were over 1,000 oil derricks west of downtown Los Angeles crowding the neighborhoods of Elysian Park, Echo Park, Westlake, and Mid-Wilshire west to Vermont Avenue. As featured in my new book, “Greetings from Los Angeles,” derricks and oil storage tanks were mere feet from homes, churches, stores, and schools. Often there were two or three derricks on one 50 x 150 foot residential lot. By the time the oil field was mostly depleted nine years later in 1901, many investors and homeowners had become rich. As the Los Angeles derricks were taken down, others would soon appear in Signal Hill, Long Beach, Santa Fe Springs, Huntington Beach, and Venice, as major oil strikes in the 1920s and ’30s made the region among America’s top oil producers before World War II. 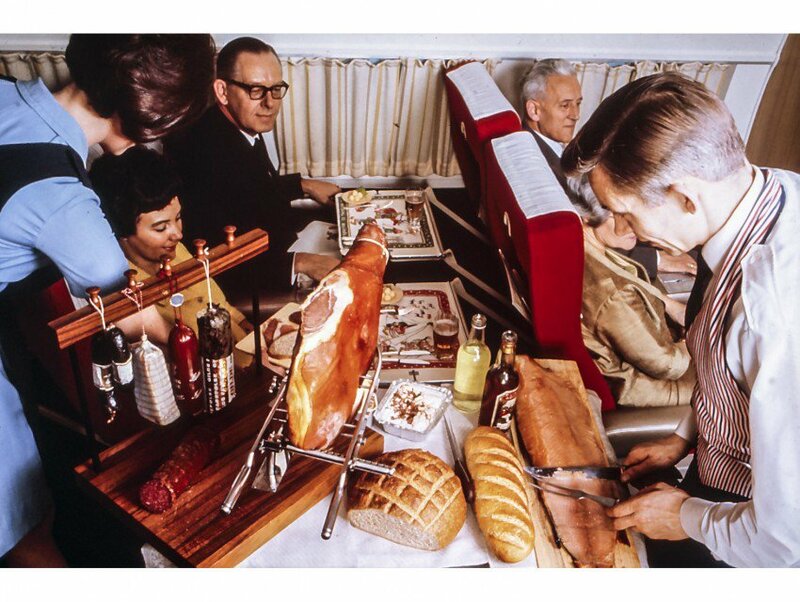 Check out this great article in Los Angeles Magazine about the history of airline food. It appeared in the magazine’s online “Ask Chris” column penned by my good friend Chris Nichols.